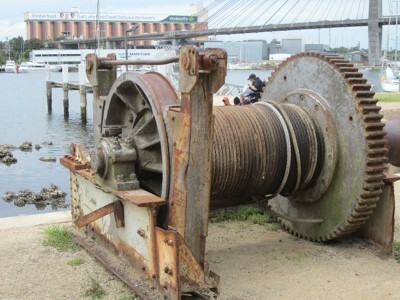 The Winch commemorates Harbour Lighterage, which repaired the floating platforms that brought timber into the bays. The Land and Environment Court approved the construction of the Bridgewater apartments in 1996 but allotted the waterfront strip to Council. The Winch commemorates Harbour Lighterage, which repaired the floating platforms that brought timber into the bays. The Land and Environment Court approved the construction of the Bridgewater apartments in 1996 but allotted the waterfront strip to Council. When Harbour Lighterage was operating, tugs moored at the wharf which then extended much further into the bay. The lighters were pulled up the slipway by a Winch, still standing at the head, so they could be repaired. The foreshortened jetty, the only private one on the Bays, is all that the Court permitted to remain. Visiting yachts are allowed to moor here.